WORK PLAY DRAW – Platform r.f. 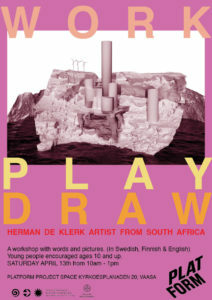 Come Saturday morning with your kids for a fun drawing workshop in English, Swedish and Finnish with South African artist Herman de Klerk. Herman is building an imaginary world called Muscle City. You can participate in creating it !We will have free coffee and treats while videos of body builders play in the background. Let’s create fun stories and draw.